In the spring of 1844, American naturalist Henry David Thoreau accidentally set fire to 300 acres of woods near Walden Pond in Massachusetts. The consequences of this fire, told through the lives of four main characters, form the narrative heart of this wonderful debut novel. WOODSBURNER brilliantly interweaves the story of Thoreau, a young pencil maker by trade; the unforgettable Oddmund Hus, a Norwegian immigrant and farmhand who pines for the love of a woman he cannot have; bookseller Eliot Calvert, an aspiring but largely unsuccessful playwright who must choose between his business and his art; and Caleb Dowdy, an opium-addicted Episcopal minister who believes he can prove God’s existence by seeking his own damnation. All four men are leading lives of quiet desperation when their encounter with Thoreau’s fire alters them forever. Seamlessly combining fiction and history, WOODSBURNER chronicles these changed lives against the background of a final compelling character: the fire itself, which gains a powerful personality as it progresses toward the town and eats away at the Concord landscape. 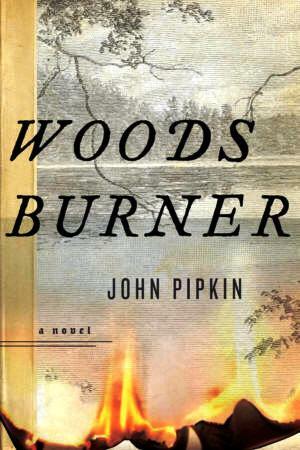 Witty, bawdy, philosophical, touching, and humorous, WOODSBURNER is a novel I didn’t want to end. This book is packed with interesting ideas, vital characters, and vivid writing. Characters whose inner lives are richly and complexly rendered, a suspenseful narrative, and impeccable period details make Woodsburner an exceptional debut. Pipkin tells his story with the verve and authority of a veteran novelist, and the result is a book that, once begun, compels the reader onward to the very last sentence. WOODBURNER is that rare work of fiction that brings the past to life so vividly it feels authentic and lived-in on every page. Pipkin populates Thoreau’s world with a wonderful array of beautifully realized characters, all of them wholly believable and true to themselves. WOODSBURNER is a terrific debut. This is a remarkable debut. The words leap gorgeously from the pages and the characters are sharply etched. Pipkin asks us to consider what the new world offered to people and easily they could squander the opportunities, wasting both the physical landscape and even the chance to start anew. Amazingly, all of the action takes place during a few hours and over a few hundred acres. But the urgency of these hours is so palpable and the destruction seemed so terrible to those experiencing it that it seems longer and larger. It’s as though the fire was burning through to the essence of each person. Although I usually read too quickly, I slowed down to savor each phrase. — Carla Cohen, Politics & Prose, Washington, D.C.